I am happy to host Jagruti's Celebrate Event for the Month of July under the Theme - Celebrate ~ Month of Shravan. Shravan Month is one of the Auspicious month of the year and its special for Lord Shiva, particularly the The Mondays of Shravan Month. This Shravan month is famous for Naga Chathurthi, Naga Panchami, Varalakshmi Vratam n Sri Krishna Jayanthi and some more festivals n Vratams. All these important festivals are coming up this month, and the Shravan Month starts from July 20th - August 17 and the event also runs throughout this month. To know more about this month n its specialty click here. Though i live thousand n thousand miles apart from my Country , I still follow all the traditional Poojai for all festive n special occasions. This Event is also for the same, to remember and celebrate those special days with all traditional& delicious Prasadhams and Offer God. 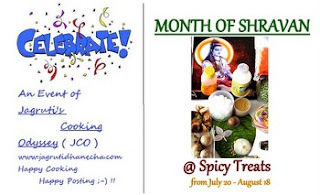 So you can submit recipes which you cook specially for Festivals like Vara Lakshmi Vratam, Sri Krishna Jayanthi, Gauri Vratam n other foods for fasting/Vrat days n special occasions of this month like Raksha Bandhan, Ekadashi etc. Cook only Vegetarian recipes. No Eggs are allowed. Dishes can be of any course, starter, main course, snacks,sweets, desserts etc. All the entries are linked to this Event announcement page and Jagruti's Event Announcement Page. Both are Mandatory. Multiple Entries are accepted, You can also link your archived entries only if they are re posted with both the announcement links. Usage of logo is highly appreciated as it helps to spread the word. Looking forward all your Festive Special Recipes and lets make this Month more Special n Offer God With all our Delicious Prasadhams & the Almighty Shower His Blessings To One & All !!! Lovely event..thank you for hosting for JCO..happy hosting !! Nice theme.will send my entry soon..
nice event dear.. will send my entries soon..
Great event. Will be submitting my entry soon! Nice event... Happy hosting !! I have linked my entry..